Enjoy a warmer Christmas in Cape Town, with all the festivities, sun, sand and fun. While Christmas falls in the middle of summer in South Africa, Cape Town still has a wonderfully festive air. The main event is the Festival of Lights held in Adderley Street, where there is a free concert as well as the spectacular lights. Enjoy Carols by Candlelight and an open-air cinema in the famous Kirstenbosch Botanical Gardens. Try your hand at yoga on Christmas Eve on Clifton's 3rd beach, or simply head to the markets to buy those last minute gifts. 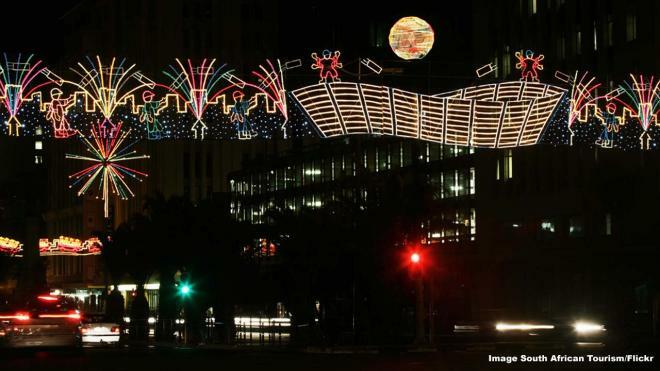 Adderley Street in Cape Town turns sparkling and festive as hundreds of lights are turned on during the first Sunday of December. Not only are the lights turned on, but there is also a great free street party. In the afternoon, a live concert is held and stalls line Adderley Street selling the perfect Christmas gifts and tasty food. Just as the African sun sets, Cape Town’s mayor turns on the lights. The displays reflect some of Cape Town’s history, as well as the usual Christmas theme. Held for a four night period in the middle of December in Kirstenbosch Botanical Garden, Carols by Candlelight is a charming annual tradition. The event is a fundraising initiative for the Rotary Club of Kirstenbosch and has been going for 26 years. People picnic on the lawns while several popular musicians entertain them. As soon as the sun sets, everyone grabs a glow stick and the carol singing begins.